As an alternative to trick-or-treating, Calvary Chapel Huntington Beach has a fall festival on October 31st each year. Eileen (who either Jeri, Nicole, Victoria, or Lizzie help on a daily basis) enjoys going to it since it is very close to her place. Lizzie wore her old-fashioned hoop dress that she made herself a year ago (most impressive). 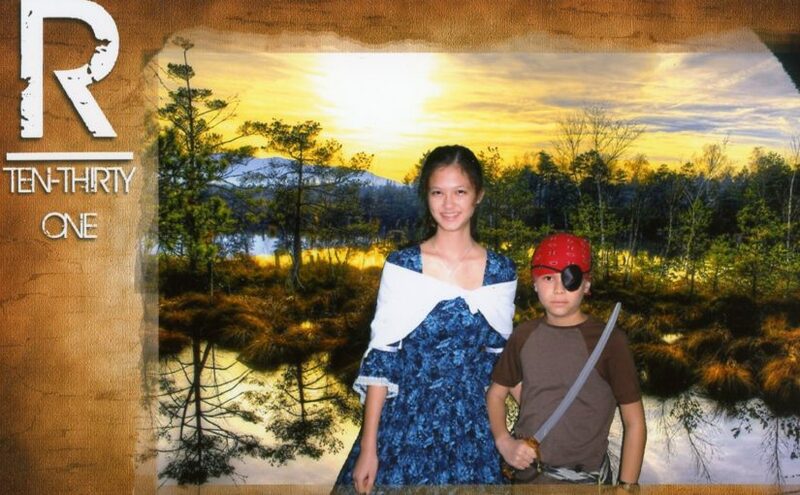 Josiah dressed up as a pirate. Here are some photos. A couple of Star Wars characters got in photos with Josiah. 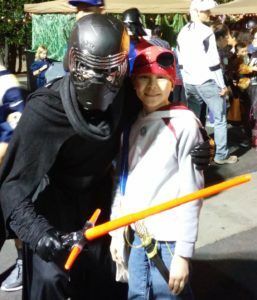 Kylo Ren and Josiah. Click photo for full size. 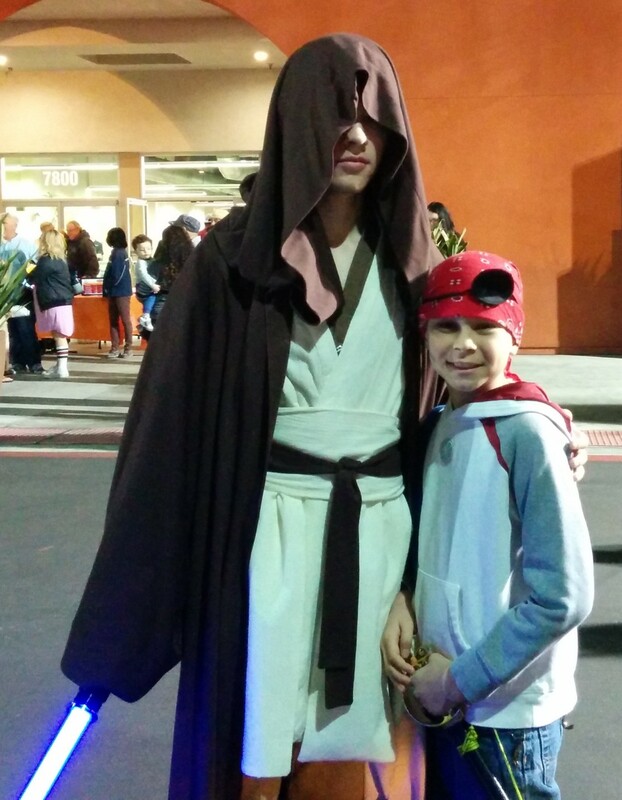 Obi-wan and Josiah. Click photo for full size. 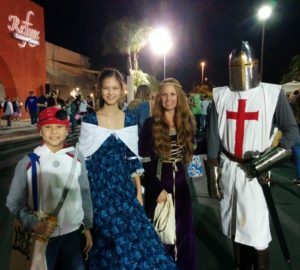 Here they are with a princess and a Crusader. Josiah, Lizzie, Princess, and Crusader. Click photo for full size. 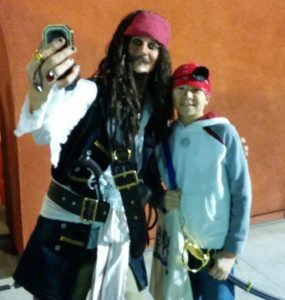 Captain Jack Sparrow and Josiah. Click photo for full size. The church had a photography company taking and printing photos at the event. Lizzie and Josiah on Halloween. Click photo for full size. Today, Jeri, Josiah and I (Tim) went to Orange Coast College in Costa Mesa (where a number of our kids have and are going to school) for the SoCal VegFest. 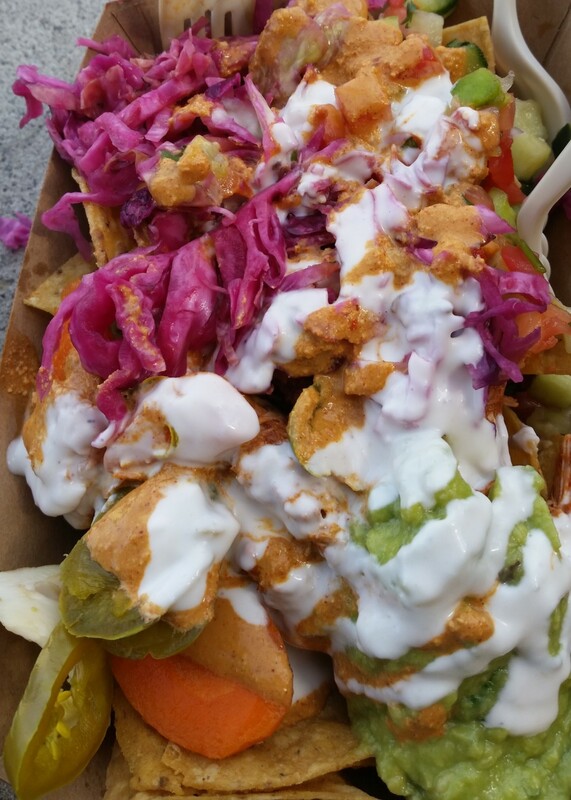 Dozens and dozens of vegan vendors were setup…giving out samples, demos, etc. 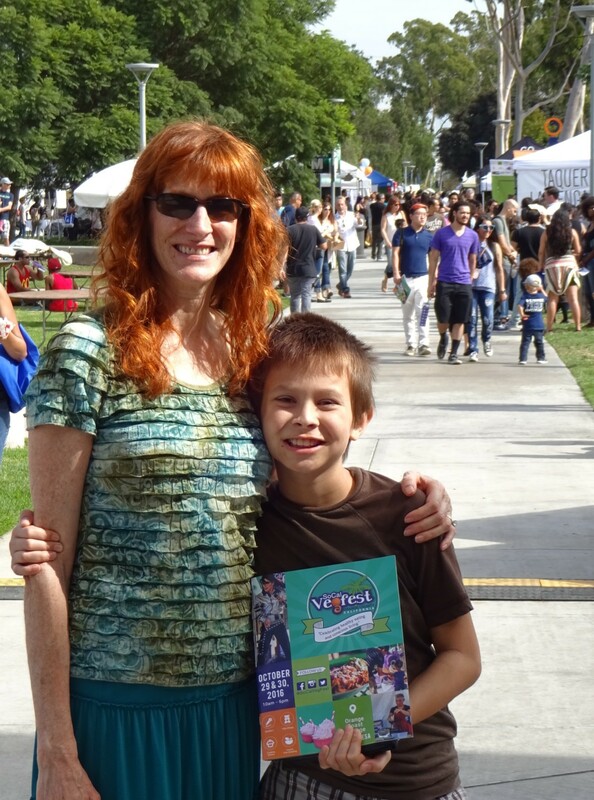 Jeri and Josiah at SoCal VegFest. Click photo for full size. 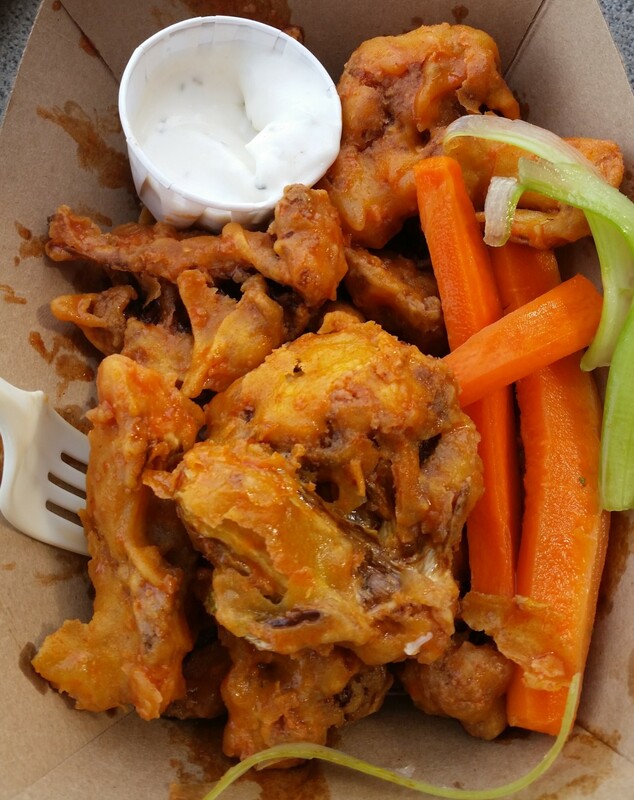 Buffalo Cauliflower Wings. Click photo for full size. Jackfruit Nachos. Click photo for full size. 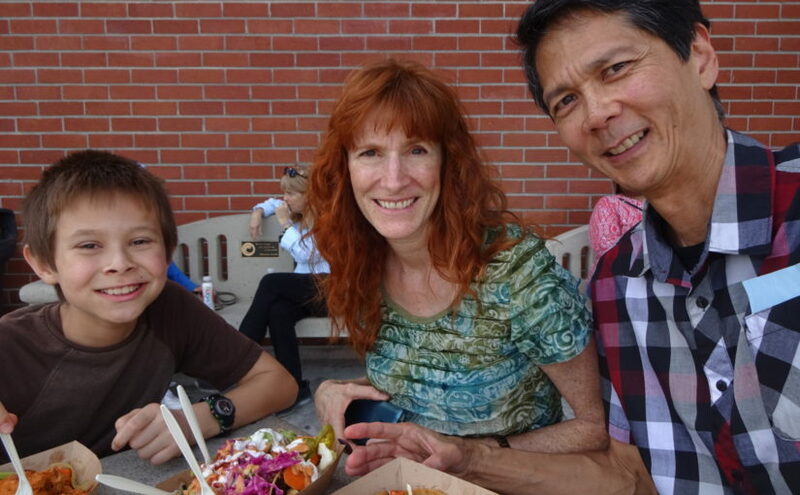 Josiah, Jeri, and Tim enjoying lunch at SoCal VegFest. Click photo for full size. We then got two scoops of vegan (coconut milk based) Mint Chip ice cream. Yum! 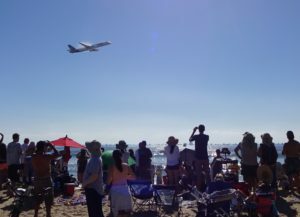 Today, Jeri, Justin, Nicole, Jeffrey, Josiah, and I (Tim) went down to the beach for a (free) air show. The temperature was mild (in the 70s). However the sun was brutally warm. 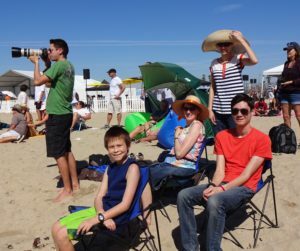 We were mostly protected by sunscreen. But some got a little burn. 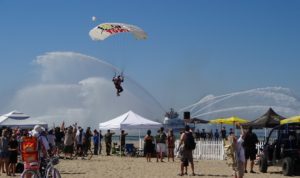 They started the show with some sky divers and the national anthem. The Long Beach Fire Boat was out spraying 50,000 gallons of water a minute! It was quite the display. Long Beach Fire Boat with Skydiver. Click photo for full size. Of course there were some awesome acts. 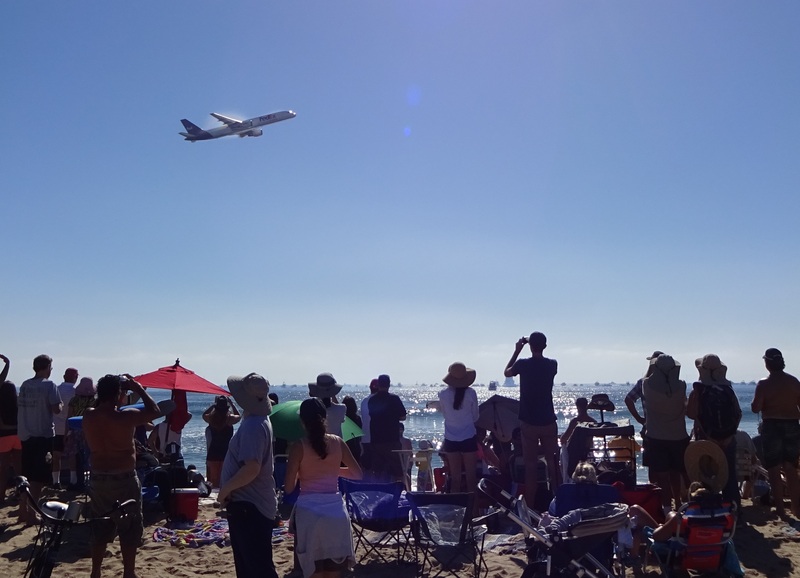 Several propeller planes did some crazy stunts. Then later in the show was a combination propeller and jet biplane. That was crazy to watch! 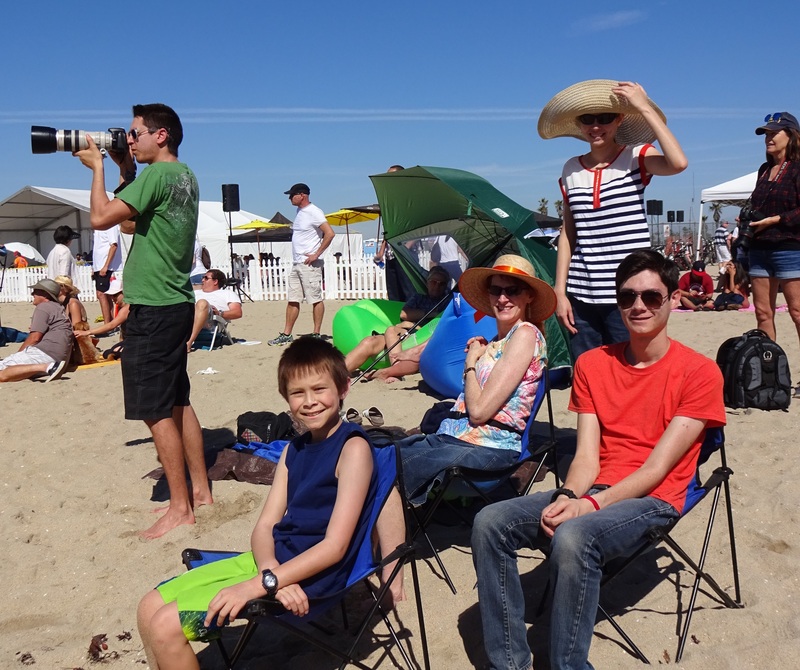 Justin, Josiah, Jeri, Nicole, and Jeffrey at the HB Air Show. Click photo for full size. During the early part of the show, five sky writing planes flew side-by-side. By synchronizing their “smoke” generation, they would write various messages in the sky including a salute to our military. Sky Writing at HB Air Show. Click photo for full size. Josiah and I got our feet wet. Then a giant wave came and got our legs wet! The search and rescue helicopter demo is in the background. 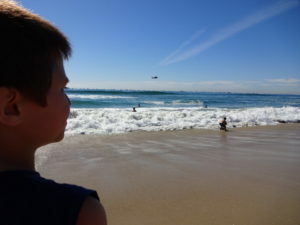 Josiah near the Water at the HB Air Show. Click photo for full size. A solo F-18 put on a nice demonstration for us. Also there was a FedEx 757 that had water vapor forming on its wings. FedEx 757 Plane with Vapor on the Wings. Click photo for full size. The grand finale was the Thunderbirds. Their 30-minute show was incredible. 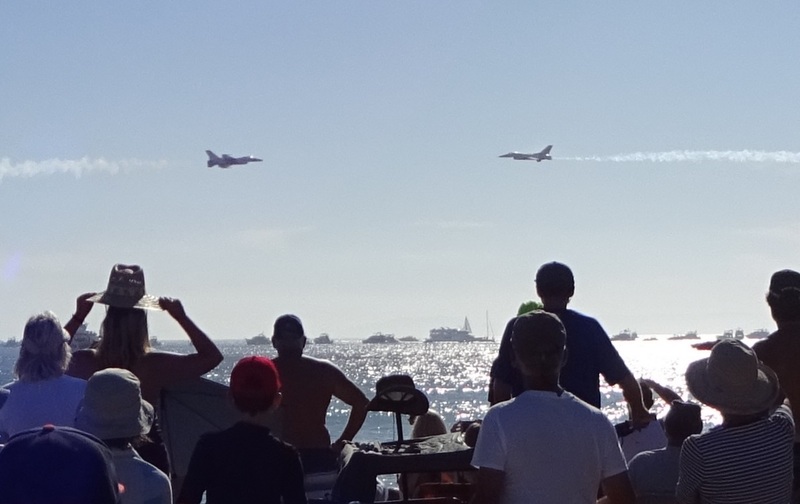 Thunderbirds Approaching Each Other. Click photo for full size. They estimated the entire crowd at 250,000 people. 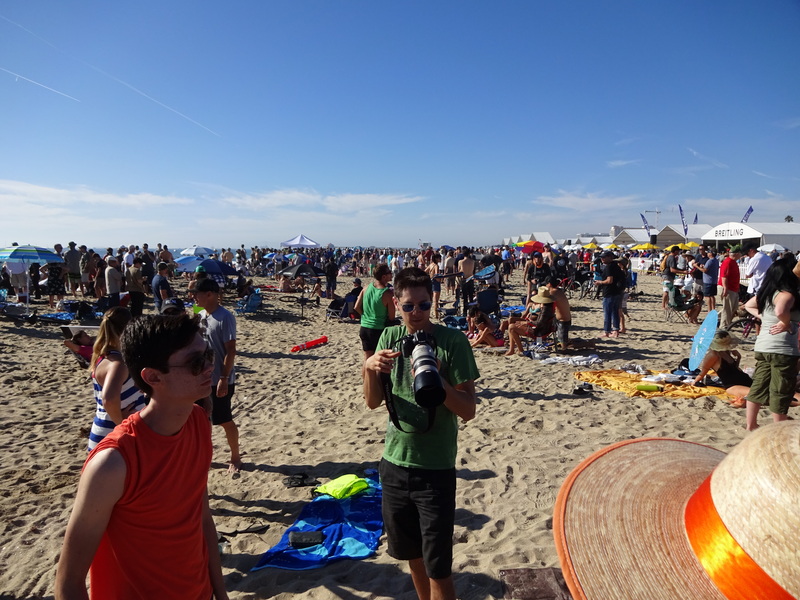 Part of the HB Air Show Crowd. Click photo for full size. 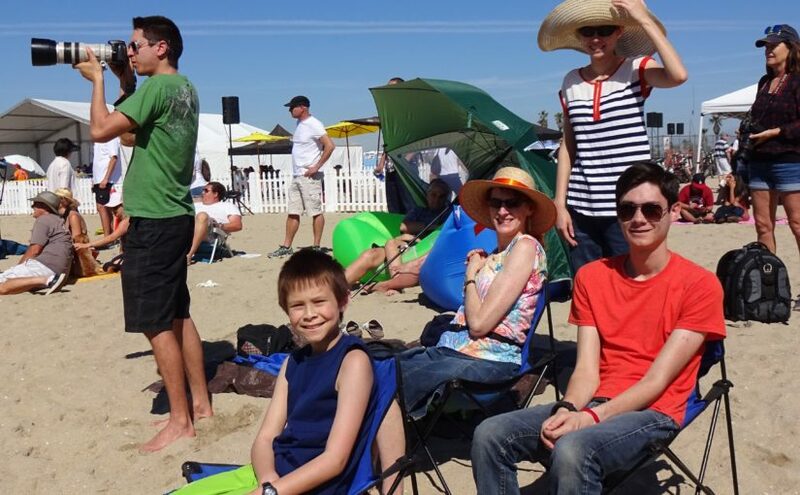 Jeffrey and Justin at HB Air Show. Click photo for full size. 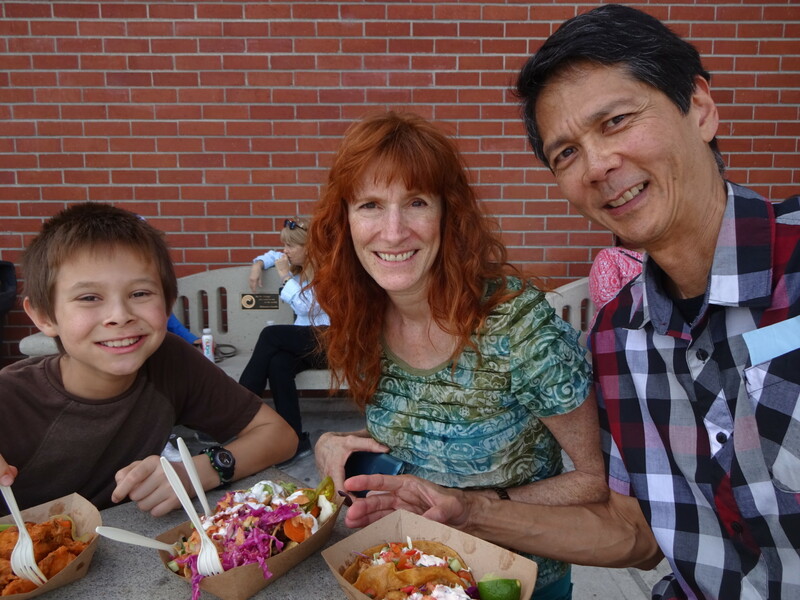 A number of food trucks and other displays were set up. 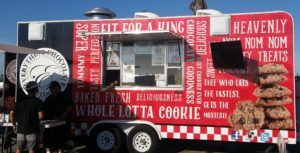 They even had a truck with chocolate chip cookies. Nom, nom! 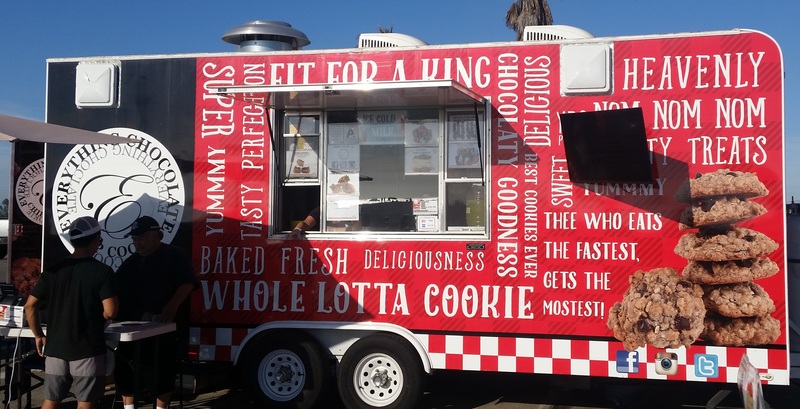 Cookie Truck at HB Air Show. Click photo for full size. 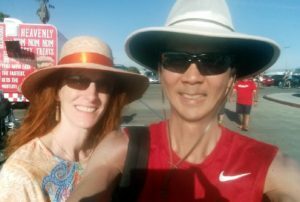 Jeri and Tim Cookie Truck Selfie. Click photo for full size. 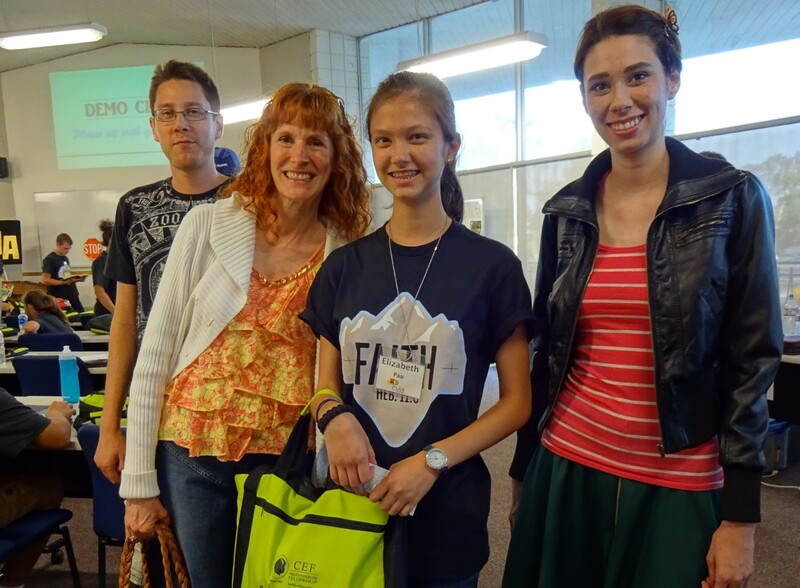 Just like last summer, Lizzie started the summer with some Christian Youth in Action (CYIA) training for the Five Day Bible Clubs. 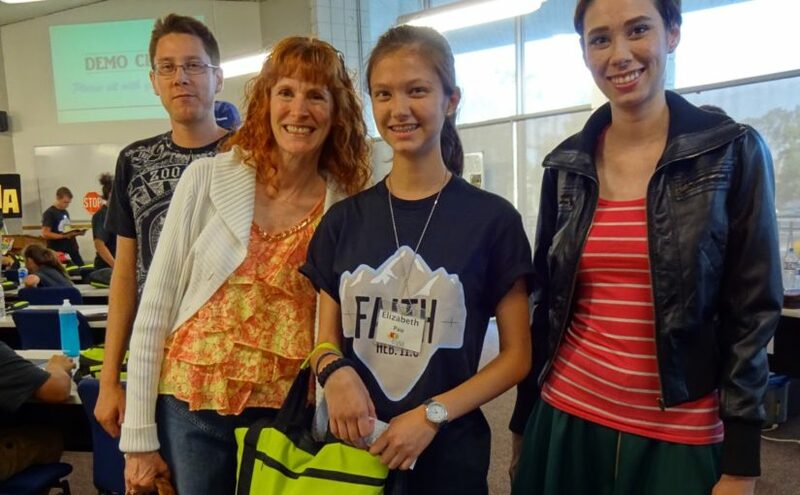 Then during the summer, she along with two other girls from our church helped run a number of clubs in various locations around Orange County. Here are some pictures from when we visited Lizzie at Hope International University in Fullerton in June. 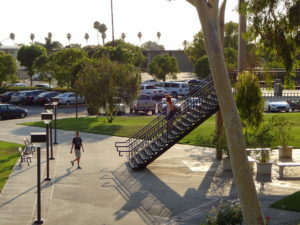 Hope International University. Click photo for full size. 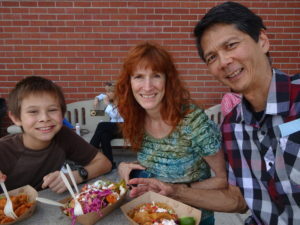 Justin, Jeri, Lizzie, and Sarah during our visit. Click photo for full size. 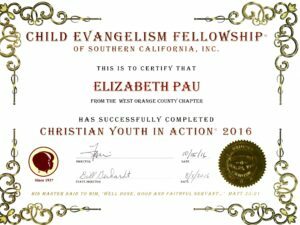 On Saturday, October 15, 2016, Child Evangelism Fellowship presented the three girls with certificates acknowledging their achievements. Then afterwards, we (Jeri, Tim, and Josiah) took Lizzie to Mitasie for a yummy vegan lunch! 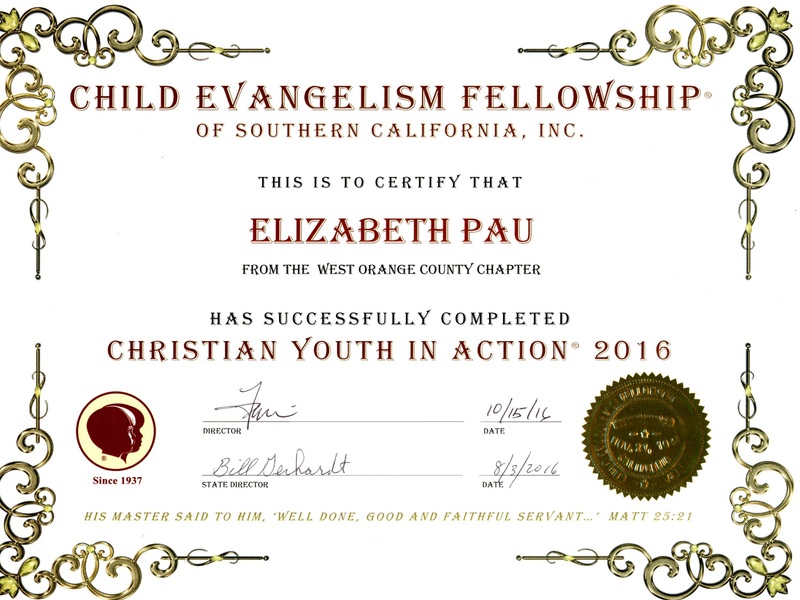 CYIA 2016 Certificate. Click photo for full size. 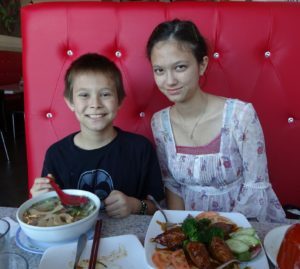 Josiah and Lizzie at Mitasie. Click photo for full size. 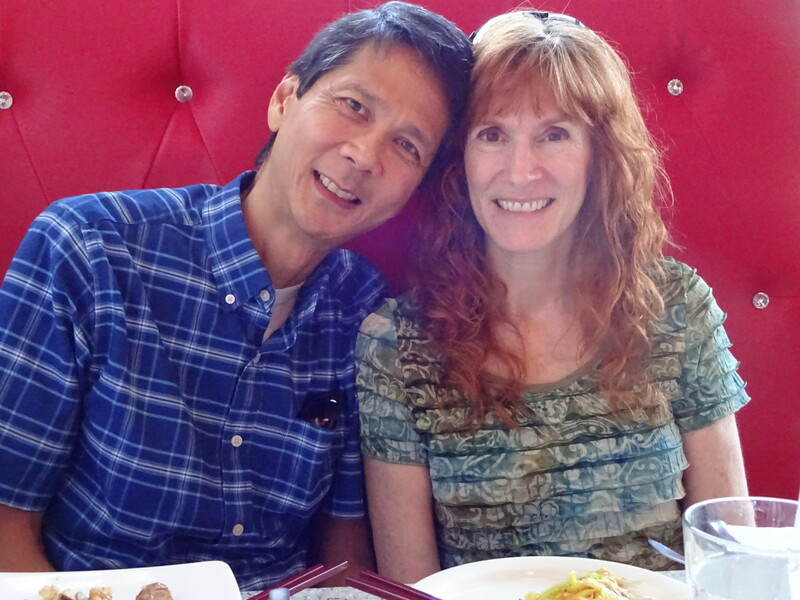 Tim and Jeri at Mitasie. Click photo for full size.